A protester holds a banner reading "Foreign currency mortgages - SOS" during a rally against the banks and the growth of the dollar in central Moscow on December 28, 2014. The European Union will extend asset freezes and travel bans imposed on dozens of Russians and Ukrainians after Moscow's annexation of Crimea to the end of this year, according to a draft statement seen by Reuters on Wednesday. A draft statement, prepared for an extraordinary meeting of EU foreign ministers on Thursday and seen by Reuters, said sanctions imposed from March last year on people undermining Ukraine's sovereignty would be extended until December 2015. According to a draft statement by the EU, the asset freezes and travel bans imposed on dozens of Russians, Russian entities, and pro-Russian separatists in Ukraine following Moscow's annexation of Ukraine's Crimean Peninsula will be extended until the end of 2015. In the document, which was leaked ahead of an extraordinary meeting of EU foreign ministers on January 29, the EU says that "in view of the worsening situation [in eastern Ukraine], the [EU] council agrees" to extend the sanctions until December. The document also calls on EU officials to present a proposal on "additional listings" to the list of sanctions within one week. It adds that the extension and any new listings to the sanctions list are designed to ensure "a swift and comprehensive implementation of the Minsk agreements, which were signed by Ukrainian, Russian, and separatist officials in September and aimed at ending hostilities and leading to the withdrawal of heavy weaponry from the line of contact." An earlier version of the draft document had said sanctions would be extended until September. A view over the shelled district of Mariupol, through a broken window on Jan. 26. US Treasury Secretary Jacob Lew has said sanctions against Russia could be extended because of the escalation of violence in east Ukraine. 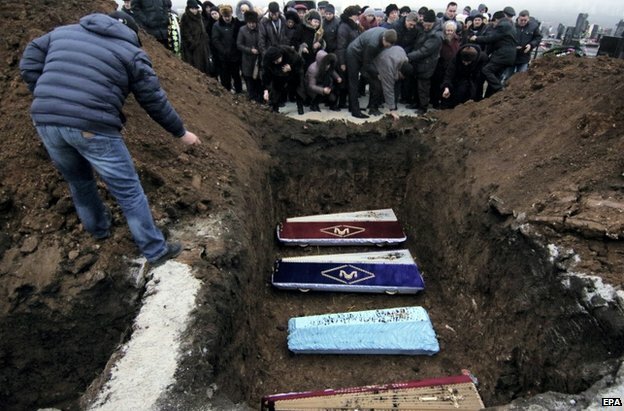 Thirty civilians were killed in an attack on the south-east Ukrainian city of Mariupol on Saturday. Secretary Jacob Lew was speaking on a visit to Kiev, after European Union leaders said they would consider "further restrictive measures" on Russia's government. Russian separatists have pushed back Ukrainian forces in several areas in the past week. But the number of casualties has steadily mounted. Shelling by Ukrainian forces killed 16 civilians in the rebel-held region of Luhansk and four in Donetsk, according to officials quoted by Russian state news agency Tass on Wednesday. More than 100 others were reportedly wounded. Ukrainian officials said the separatists had targeted 55 towns and villages in the past 24 hours. There were no details of civilian casualties but they said three soldiers had been killed. A main focus of rebel attacks is the town of Debaltseve, a road and rail hub near Donetsk, which separatist leader Eduard Basurin has described as a "wedge" between rebel-held areas. Mr Lew said Washington's first choice was a diplomatic resolution to lessen sanctions, but "we are prepared to do more if necessary". His remarks came hours after President Barack Obama spoke on the phone to German Chancellor Angela Merkel and issued a statement saying the two leaders were concerned about "Russia's materiel support for the separatists". Russia denies involvement in eastern Ukraine, saying if any Russians are fighting there they are doing in a voluntary capacity. EU foreign ministers will hold a special meeting in Brussels on Thursday to consider how to respond to the current escalation, including the killing of 30 civilians in the south-east Ukrainian city of Mariupol on Saturday. "We note evidence of continued and growing support given to the separatists by Russia, which underlines Russia's responsibility," EU leaders said. The ministers could ask the European Commission to draw up further sanctions, which would then go before EU leaders, most likely at a summit scheduled for 12 February. However, Greece's new government said on Tuesday that the statement issued by EU leaders did not have its approval. Prime Minister Alexis Tsipras and Foreign Minister Nikos Kotzias are known to be opposed to sanctions on Russia and could prevent the EU's 28 member states from reaching a unified position on further measures. The US treasury secretary was in Kiev to sign a $2bn (£1.3bn; €1.75bn) loan agreement, which is conditional on the government making fiscal reforms and tackling corruption. IMF officials are also in Kiev to discuss extending last year's $17bn bail-out package. The government is estimated to need a further $15bn in funding.